Castleridge: Is this for You? Search for about Calgary neighbourhoods. Where is Castleridge? In the northeast part of Calgary, between McKnight Blvd and 64 Avenue as well as from 44 Street east to FalconRidge Boulevard. Look for the number 159 on the map for a better idea. Around 6000 people live here. It houses Canada's largest mosque, the Baitun Nur Mosque which belongs to the Ahmadiyya Muslim Community. The land on which this area is built was annexed by the city of Calgary in 1961 and homes sprang up in the 1979-81 Alberta housing boom. There is a proud community association here and the North of McKnight community center adds many additional services to that. Health, recreation and fitness are always a good thing. So here we have things like a community-minded teen hang-out and drop in centre to provide opportunities for sports and recreation. Real estate ads typically describe this great location as one with quiet streets near schools and shopping (including Safeway and Superstore) and within walking distance to neighborhood playgrounds and the nearest C-Train station. Drivers enjoy easy access to the Stoney trail freeway, Deerfoot Trail and the Calgary airport. What are the strong points in Castleridge? This place is really about value. Young families starting out often buy their first home either here or in surrounding communities, because of the ability to get affordable stand-alone houses. One part of this neighbourhood, Castleridge Estates, lies to the south of Castlebrook Drive. In these more spacious lots shown above we find homes 50 percent larger and more expensive than those in the surrounding area. But still a very good value indeed. Residents here get decent views of the mountains and downtown, even in the same view for a photo. There is plenty of space for walking around and a giant waterpark just to the west. If you have kids, you need to think about education. Residents here have some choices for sending kids to school. Kindergarten to grade 6 attend O.W. Geiger School, Junior highs go to Terry Fox School and the older ones go over to James Fowler High School. The Catholic School District offers John Paul II School and St. Wilfrid for the young ones, St. Martha and Blessed John XXIII Junior High schools, and Bishop McNally (just to the east) for grades 10 to 12. 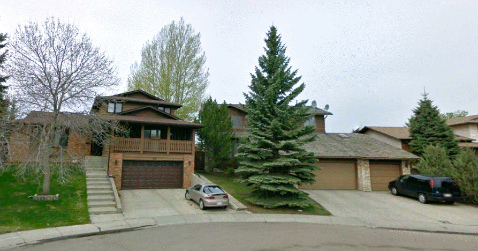 Go back from Castleridge to the Calgary Real Estate web page, or visit the Calgary City Maps homepage.